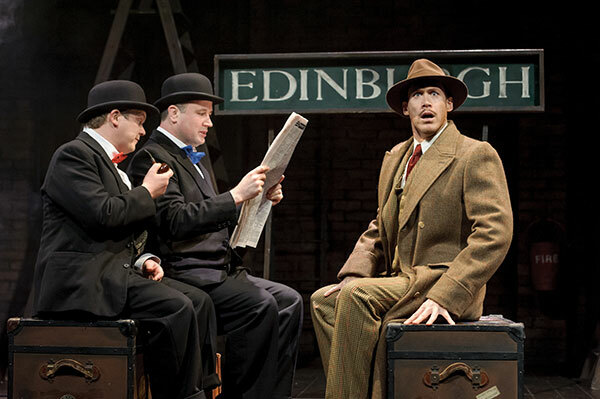 The West End’s long-running show, THE 39 STEPS, will tour the UK and Ireland next year to mark the Olivier Award-Winning Comedy’s 10th anniversary. 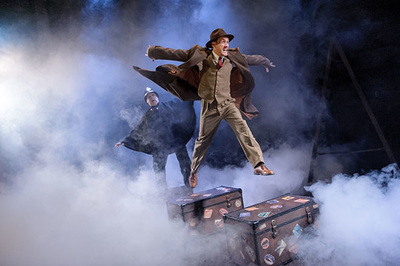 Based on Alfred Hitchcock’s 1935 movie and John Buchan’s 1914 spy thriller The Thirty Nine Steps and adapted for the stage by Patrick Barlow, THE 39 STEPS will visit 24 cities, including Dublin, from 7 January to 2 July. 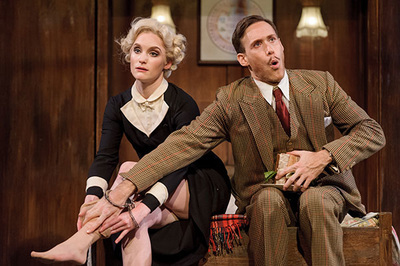 THE 39 STEPS follows dashing hero Richard Hannay - complete with stiff upper lip, British gung-ho and pencil moustache - in a dangerous tale of cat-and-mouse from London to the Scottish Highlands. In this hilarious production four actors play over 130 characters in 100 minutes. 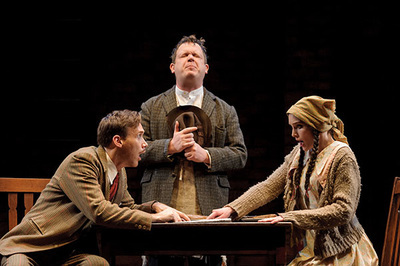 The cast for this touring production are Richard Ede (the eponymous hero Hannay), Olivia Greene (the three women in Hannay’s life, Pamela, Annabella and Margaret) and the myriad of other roles are played with breath-taking speed and dexterity by Andrew Hodges and Rob Witcomb. We thought we'd try and find out a bit more about the show from its leading actor, Richard Ede. Here's what he had to say. Please tell us and a little bit about yourself and your acting career to date. What have been some of the career highlights for you? Well I've been acting for twenty years now, but obviously the highlight of my career has been playing Richard Hannay! Before this I have been lucky enough to travel the world as an actor - I toured for 6 years with various Shakespeare productions in over 30 countries worldwide. It was a fascinating experience, both playing Shakespeare to foreign audiences - but also as a tourist for over half a decade! 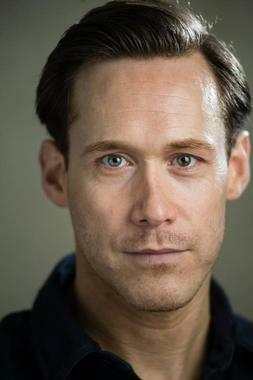 I see from your CV that you played the role of Richard Hannay before. What’s brought you back to the role again? What’s so special about this character for you? Hannay is a wonderful character to portray. It's an interesting dynamic to play the straight-man in such a hilarious show, but it's so important to anchor the comedy in an interesting plot-line. If the audience don't care about Hannay (even when he's being difficult) then we won't keep their attention. I feel the pressure of that but it's a great challenge and it's what brought me back. I had, however forgotten quite how physical the show is. I have remembered this now and have the bruises to prove it. What are the audiences for The 39 Steps like? 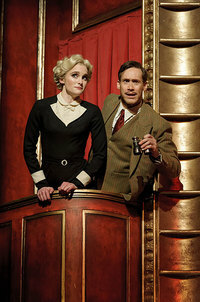 Audiences across the country differ wildly - but they have one thing in common - they all love The 39 Steps! It's a lovely feeling to know you're in a "crowd pleaser" and our show certainly fits that bill. There is a lot to enjoy, whether it be the comedy, adventure or the romance - everyone can take something positive from their evening. What are some of the memorable moments from your previous time in the show? It's great to be on tour and play theatres that you haven't seen yet or towns you don't know very well. We got some lovely reviews on the last tour (and have started this tour with 5 star reviews) but I think my favourite part was meeting interesting people - both within our team but also in our theatre 'digs' (the accommodation where we live on tour.) We all had some memorable evenings out, but I won't go into detail here! Although you only play one character in the show, the other three cast members play many. What’s that like for you? It is a double-edged sword to only play one character in a multi-role show. I see the guys in the wings getting changed, sometimes even on-stage. Every time I see them they're in a new costume. However, the reason Hannay never changes is because I NEVER GO OFF STAGE. That's a bit of an exaggeration, but I probably get one minute off stage during the whole show. It is exhausting but it makes the show fly by! The show must be pretty full-on, particularly back-stage. Is it all chaos in the wings or an oasis of organised calm? It's certainly not the latter. We do have a wonderful backstage team who are waiting and ready to ably assist in whatever quick change needs performing or prop needs changing. Sadly for them, they have four sweaty idiots running at them with show-adrenaline coursing through their veins. I'm often on stage during the show and I just hear a crash in the wings. The audience think it's probably part of the performance. What are your top tips for surviving weeks on the road touring in a show? Find a good cafe in each town early on. The team this year are a really social bunch so actually I think the tour will be a joy. We found a nice cafe in Northampton (our opening venue in January 2016) and it was great to meet up before shows. I'm looking forward to the weather getting a bit warmer too. I love to wander around the towns we visit - and we're only in each town for a week so you can't get bored. I can’t get a cold though - nobody wants to see a snotty Hannay. In general, do you have a preference for a particular type of character part? What acting role would you love to be offered? When I was offered an audition for Hannay I thought "this is exactly the kind of role I could play" - I seem to be cast in plays set at least 70 years ago! I think I've got one of those faces. Actually, that said - I'd love to get offered a role in something futuristic - I'm a huge science fiction fan so that would make my day. I get offered a lot of comic roles because I can occasionally be quite funny! It's interesting in this show that even the "straight-man" needs good comic timing because the show is so slick and clever. There's a great saying: "If you want to get famous, be in movies. If you want to be rich, get on TV. If you want to be good, do theatre." Sadly I never get offered TV or film so I'm poor, unknown but good! I would love the opportunity to be in a film (in fact I was offered a 'Mr. Darcy' type role this year but it clashed with The 39 Steps) - and I'm really going to push towards that so watch this space. Well, not this space - a cinema screen space. There is something rather wonderful about theatre though - that immediacy of response between the actor and the audience is really rather special. When an audience really react well to the show, what they don't realise is that they've given us actors exactly the same feeling. The 39 Steps is a great night out. We get very positive feedback from the audience - especially those people who maybe don't always enjoy going or feel dragged along! As I said, with this show you get an adventure story, a romance and a comedy so it has broad appeal. We also get a lot of people who have seen the show before; I think that's because it's so detailed - there are a lot of "blink and you miss it" moments that people don't catch until the second or third viewing.